A chronological report on the Rumtek Court Case and the inventorisation of all the moveable and immovable properties of Rumtek Monastery. Rumtek Monastery was established and developed by the late 16th Gyalwa Karmapa, Rangjung Rigpai Dorje on a site measuring 74 acres offered to him by King Tashi Namgyal of Sikkim in 1962. His Holiness kept all religious Buddhist relics and antique religious instruments of the Karma Kagyu lineage in this monastery, Rumtek Monastery, and the Monastery became a very famous Buddhist teaching center in the World. On 6th Nov. 1981, the 16th Gyalwa Karmapa passed away in Chicago, USA. Immediately afterwards the Karmapa Charitable Trust took over the Monastery and it’s Administration. The Karmapa Charitable Trust was set up by the late 16th Gyalwa Karmapa in 1962, the same year he started the construction of the Monastery. The Trust comprised of seven Trustees, six of them were lay and one of them was Topga Rinpoche, who was Karmapa’s nephew. The letter requested them to resign as Trustees of the Karmapa Charitable Trust. For that purpose, they even lied by claiming that the request was made on behalf of the entire Monk Body of Rumtek Monastery; the letter also requested the two Trustees for an immediate written confirmation if they agreed to resign. The three Rinpoches’ aim was to create four vacancies in the Board so that Shamar, Situ, Kongtrul, and Gyaltsab, four of them could step in. Mr. Ashok Verma believed them; he accepted their request and confirmed his resignation in writing. He accused them of harboring intention to take over the Trust. An argument ensued between Topga Rinpoche and Kongtrul Rinpoch. Trustees Mr. Densapa and Mr. T.S. Gyaltsen were then too kind hearted and polite in the face of pressure from Kongtrul Rinpoche, and so they spoke out in sympathy with Kongtrul Rinpoche and accepted the three Rinpoches’ request to join the Board of Trustees. As a result, Shamarpa Rinpoche (being the senior-most of all the Rinpoches) Situ Rinpoche and Kongtrul Rinpoche became Trustees. They took over Rumtek Monastery within 12 hours. The takeover was illegal as well as violent. Since then until 1998 The Karmapa Charitable could not do anything about this illegal occupation of Rumtek Monastery out of consideration for Trustee J. D. Densapa, who was threatened by Situ and Gyaltsab Rinpoches’ party in Sikkim not to take any legal action against them. 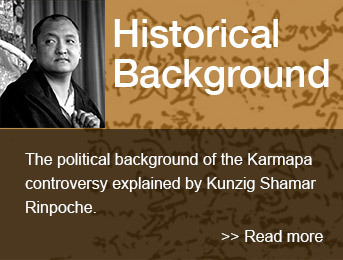 In 1996 Shamarpa Rinpoche won over J.D. Densapa, who then offered to resign from the Trust. At the same time Mr. T.S. Gyaltsen, Topga Rinpoche and Mr. Gyan Joty appointed him as chief executive of the trust to take the necessary actions against the illegal occupants and the Government of Sikkim. 1. The State Government of Sikkim and Gyaltsab Rinpoche (Gyaltsab had to appear in the Court since Situ Rinpoche was banned by the Indian Government from entering Sikkim) said that the case against them should be disqualified because, with the exception of Shamar Rinpoche’s signature, it did not have the signatures of all of the Trustees. But on 17th October, 2001, the Trust’s lawyers, Mr. S.S. Hamal, Mr. Praveen Agarwal and Mr. Bhattacharya finally managed to win over all the arguments in Court. As a result the Court ordered an Inventorisation of all the properties of Rumtek Monastery. For this they appointed the Regional Director (Calcutta) of the Reserve Bank of India, Mr. V.K. Sharma as Commissioner to lead the Inventory. The Reserve Bank of India refused this order a few times but the Court prevailed in the end. This was the reason why the Commissioner’s meeting with the contending parties had to wait until April, 2002. On 4th of April the Commissioner came to Gangtok, Sikkim to meet with both parties and managed to fix the date for the Inventory on 14th of May, 2002. On 9th of May, however, the State Government of Sikkim objected to the Inventory by writing to the Commissioner to the effect that the Commissioner’s coming to Sikkim would cause serious law and order problems among the population. The Commissioner then duly notified the High Court on 10th of May. The High Court then warned the State Government that it might take action to dissolve the State Government if it refused to respect the Court’s decision and failed to assist the Commissioner with the inventory taking. Then taking heed of the warning the Sikkimese Government surrendered and promised to keep law and order and assist the Commissioner with the Inventory. On 18th of June, 2002, the high Court called all the parties and scolded the lawyer for the Sikkimese Government for his disobedience to the Court and fix the Inventory on 8th July. After this the State Government of Sikkim (Defendants No. 1 and 2) and Gyatshab Rinpoche’s party (Defendant No. 3) became terribly demoralized. On the 22nd June, 2002, eight members of the Joint Action Committee came to see Mr. T.S. Gyaltsen (a senior Trustee of the Karmapa Charitable Trust), and literally begged him to stop the inventory out of his compassion for Situ Rinpoche and Gyaltsab Rinpoche. Mr. T.S. Gyaltsen asked them if the Karmapa’s relics were still there in the Monastery, they said that they should be there. Then T.S. Gyaltsen said that in that case there should be no reason to stop the inventory from proceeding since, as they had said, all the relics were intact. But they kept begging even though they had nothing to add on the subject any more. These members (Joint Action Committee) then tried a different tack and explained that the controversy was due to rivalry between Situ Rinpoche’s and Shamar Rinpoche’s factions, to which T. S. Gyaltsen countered by saying that while Sikkim was a Buddhist Country which followed the Nyingma and the Karma Kagyu traditions and that all these Tibetan Lamas were also guests in their country, so “isn’t it a terrible shame that you as Sikkimese should take sides in your guests’ quarrels” and thus aggravating the controversy even further when “you should instead be helping them to resolve their problems peacefully”.